Do you ever think that only the lucky get published? I sometimes despair when, after hours toiling over a story, it wings its way straight back to me in its self-addressed envelope. The highlight of this trip to Haworth was a guided tour with BronteWalks. I was brought up in West Yorkshire and had many trips to Howarth when I was younger but all that stuck in my mind from those visits was the tiny handwritten books that the sisters made as children and the drunken lifestyle of their brother, Branwell. There were 2 older Bronte siblings who died in childhood. The Bronte sisters disliked their work as governesses and dreamed of opening their own school. Branwell painted himself out of his famous portrait of the sisters – see it here. The sisters’ father, Patrick, outlived his wife and all 6 of his children. He died aged 84. Following the tour I visited the sisters’ Parsonage home with my eyes newly opened. I imagined the sisters discussing and critiquing each others work in the dining room and saw the room where Branwell died, with his family gathered around him. The Brontes lives were shadowed in sadness and beset by difficulties but despite this (or maybe because of this?) they produced world-class fiction. This entry was posted on November 19, 2012, 9:00 am and is filed under Authors, Travel. You can follow any responses to this entry through RSS 2.0. You can leave a response, or trackback from your own site. Morton, I think we often assume that others are more successful than us because they don’t have our problems/lack of time/other hurdles to overcome. But most of the time it’s not true! I think luck does come into it sometimes. Yes, Patsy. I think success is a lot of hard work and maybe a little bit of sending the right thing to the right person at the right time. Lovely to hear of your visit Sally. This is still on my ‘places to visit’ list as have devoured several books on the lives of the Brontes. I hope the lucky counter works for you, Sally. Thanks for the post about your visit. It’s made me want to go and see for myself. Hope you enjoy it if you get to Haworth, Keith. What a lovely piece of inspiring work Sally. I love the story of the Bronte Sisters and Branwell, against all odds they produced such beautiful writing. It is encouraging when an amateur writer gets a first rejection to read how other writers stoically carry on and keep submitting. I must confess, it has stopped me writing for a while as I (really shouldn’t have gone down this road …but!) thought why am I doing this, I’m not a writer, I’m just playing at being a writer. I must pick up my pen – or should that be “place fingers on the computer keys”, once again and try to find another publisher. The trouble is, out there, there are not many publishers around that accept unsolicited manuscripts. Writing is not easy and getting a rejection on your “masterpiece” 🙂 is even harder. Margaret, you are absolutely right – writing is not easy! And rejections are very demoralising. But it does help knowing that there’s a whole ‘gang’ of us here in blogland who are all experiencing exactly the same thing. Keep going! Susan, I agree writing to keep a roof over your head must be incredibly stressful – but it would certainly focus the mind and do away with procrastination! A very enjoyable post, Sally and I wish you luck with your writing. Thanks, Christine. Good Luck to you, too! I’m not at all superstitious – but I’ll definitely take a detour to that counter next time I’m in Yorkshire! Linda, if you do, make sure you go on a tour to get the most out of your trip. Lovely post and super pic of you at the lucky counter! I always admire writers of the pre-digital age for producing their manuscripts by hand – such long novels to be written in pen and ink. Even a biro would have seemed high tech to the Brontes. And then of course set in hot metal, moveable type. It’s a wonder that books ever caught on, really! We modern writers have it so easy by comparison. Typing this comment on my phone LOL. Debbie – you’re right, it’s hard to imagine writing a whole book with no cut, paste or insert facility!To use a phrase of my grandmother’s – writers today “don’t know they’re born”. 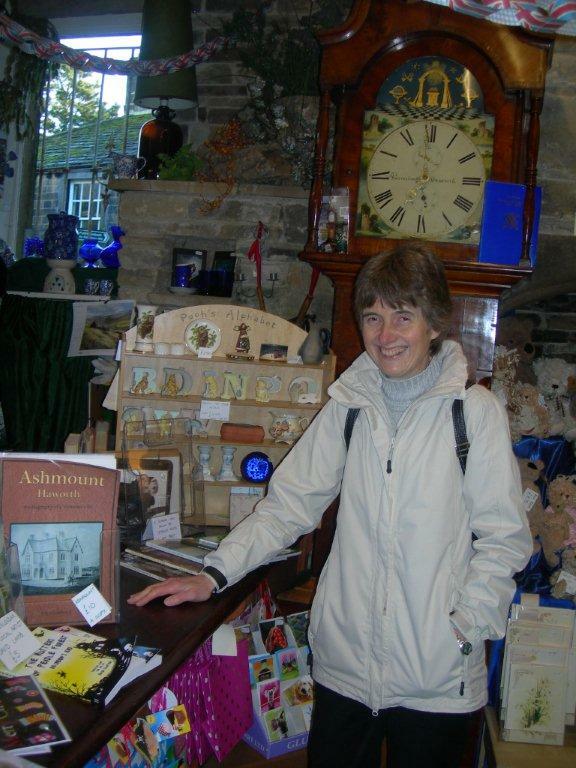 I visited Haworth last year, absolutely loved the parsonage, missed the post office though – I would have visited and touched the counter too if I’d known! There’s an excuse for going again, Trish!